New records of ammonites showing poorly known sutural anomaly, so-called sutural pseudoinversion, are discussed. 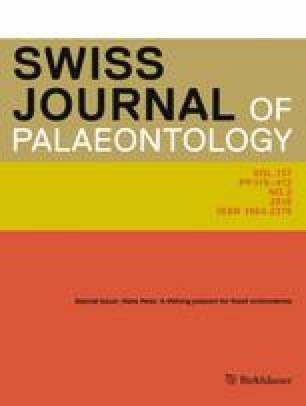 For the first time, sutural pseudoinversion was found in non-heteromorph Jurassic and Lower Cretaceous ammonoids, which are belonging to 10 genera (Dorsetensia, Indosphinctes, Erymnoceras, Pictonia, Aspidoceras, Kachpurites, Craspedites, Delphinites, Nikitinoceras and Immunitoceras) and 8 families (Sonniniidae, Pseudoperisphinctidae, Pachyceratidae, Aulacostephanidae, Aspidoceratidae, Craspeditidae, Neocomitidae and Parahoplitidae). Two types of sutural pseudoinversion were recognized: normal sutural pseudoinversion, in which the outline of small elements in lobes and saddles is fully reversed, and transitional sutural pseudoinversion, characterized by changes in the outline of folioles only. Usually, sutural pseudoinversion occurs in the terminal part of the phragmocone and becomes especially clear on the last sutures near the body chamber, but in some studied specimens sutural pseudoinversion appears in middle whorls and can be traced further up to the last visible sutures. Sutural pseudoinversion could not be caused by mechanical compression of saddles due to sutural asymmetry or strong development of sculptural elements as Bayer (Lethaia 11:307–313, 1978) assumed. Pseudoinversion is usually (although not always) visible in all sutural elements. Although pseudoinversion is known in those taxa with strong sutural asymmetry, pseudoinversion and asymmetry often affected different specimens. Influence of hydrostatic overpressure during the septal formation as well as parasite infestation on development of sutural pseudoinversion is considered to be unlikely. Instead, an abnormality appears to be a case of homeotic mutation, possibly caused by transcription errors in polarity genes. Much more common occurrence of sutural pseudoinversion in ammonites than it was expected previously suggest that it could be a relatively common phenomenon that needs increased attention in the future. This study was supported by RFBR Grant No. 18-05-01070 and followed the research plan of the Geological Institute of RAS No. 0135-2018-0035. I am indebted to Aleksei Shmakov (Paleontological Institute of RAS, Moscow), Aleksandr Mironenko (Geological Institute of RAS, Moscow), Aleksandr Igolnikov (Institute of Petroleum Geology and Geophysics, Novosibirsk), Vasily Mitta (Paleontological Institute of RAS, Moscow), Josep A. Moreno-Bedmar (Universidad Nacional Autónoma de México, Mexico) and Andrzej Wierzbowski (Warsaw University, Warsaw, Poland) for providing some of the studied specimens or their photographs. The comments by two anonymous reviewers significantly improved this manuscript.